Wwonderful adventure on Manang valley. From warm sub-tropical to cooler alpine hills and towards arctic zone of ice and glacier exploring colorful traditional villages and monasteries of different cultures and religions grand panorama of Annapurna Himalaya within high and scenic Manang valley and Nar Phu adventure on hidden trail to Nar Phu villages and crossing high Kang-la and Thorang-la enchanting alpine woodlands lined with rhododendron, magnolia and pine trees from beautiful Manang areas towards Kaligandaki River valley at Mustang district. Nar Phu Valley Trek or Annapurna view trek is one of the best popular trekking in Nepal Nar Phu Valley Trek leads you to a wonderful adventure on high and scenic Manang valley, where walk leads into hidden areas on the least visited and explored route by other main flow of trekkers and adventurer, truly an adventure out of this world. a beautiful and scenic area around remote isolated areas of upper Manang valley, where Nar Phu villages located between North of Annapurna and close to Damodar Himal and on off the beaten trails after walking on the popular Annapurna Circuit Trekking route. 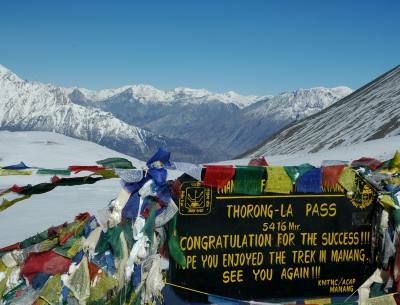 Nar Phu Valley Trekking leads you to cross over two scenic high passes of Kang-La 5,240 m /17,292 & Thorang-La Pass 5,416 m / 17, 872 ft with ever exciting time on this high altitude adventure facing incredible panorama of mountains that never been seen on other areas of Himalaya. walk follows from warm areas towards cooler zone of alpine climate, and then climb towards high Nar Phu villages exploring lovely places with tour of its old Buddhist monasteries and then heading to cross over high Kang-La pass to reach the main Annapurna trail at Manang village from Manang walk continues towards high Thorang-La pass above 5,416 m the highest point of the adventure and then heading towards world deepest gorge of Kaligandaki River. This beautiful walk leads above the river to reach Jomsom the headquarter town of Mustang district located on old Trans Himalayan Salt and Caravan Trail of Nepal & Tibet which leads beyond Jomsom towards Upper Mustang. our fantastic adventure Nar Phu valley Trek concludes with a scenic flight to beautiful Pokhara a famous touristic spot blessed with natural wonders with serene lakes and mountains and then ending the last part of the journey back in Kathmandu with overwhelming time and incredible experience on Nar Phu Valley Trek. 1Arrive in Kathmandu via respective airlines and transfer to hotel. On arrival at Kathmandu international airport you will be well received by Reasonable Treks & Tour staff and guide and then transfer you to your hotels within the hub of Kathmandu city around the most happening and exciting place around Thamel. An evening after checking into your rooms with refreshment our guides will brief regarding Nar & Phu trekking and with welcome dinner in a nice authentic Nepalese restaurant with culture show. 3Drive to Syange 1,140m via Besisar - 06 hrs.Starting early with an overland drive towards the foothills of Annapurna and Lamjung Himal with an interesting overland drive towards Nepal midwest, as the drive reaches at Besisahar town (headquarter of Lamjung district). From here getting into another vehicle and then continue to drive past Khudi, Bhulbhule and Ngadi villages following Marysangdi River upstream. Drive continues through rice terraces fields and villages to Syange a small village for the overnight stop in the comfort of the nice lodge. 4Trek to Dharapani 1,943 m - 06 hrs.Our first day walk starts from Syange with a climb on leaving Marysangdi River below to reach at Jagat village, a farm village, after Jagat walk leads on winding path to Chamje, and back at Marysangdi River crossing to east side into forested area, with super views of Annapurna and Manaslu mountain ranges. as the walk continues reaching a nice village at Tal Besi, from here another 3 hours walk leads to our overnight stop at Dharapani village. Dharapani a nice village located on a junction of Annapurna circuit and Manaslu trekking trail. 5Trek to Koto 2,640 m - 05 hrsFrom Dharapani walking into cooler areas within rhododendron and pine forest past Bagarchap and Danque then at Timang village where you can find more Buddhist cultured village including views of Mt. Manaslu 8,163m / 26,781ft. From this scenic Timang village few hours trek leads to Koto for overnight stop near the town of Chame. (a large major town of Manang area and a head quarter town of the district). 6Trek to Meta 3,560 m -06 hrsAfter Koto our route leads north away from main Annapurna circuit trail for a week heading north towards Nar & Phu villages within hidden areas of Upper Manang valley which is close from Tibet border walking into a country of blue sheep’s and snow leopards. Trek leads into narrow valley with forest of pines and rhododendron trees, then reaching nice pasture fields with huts and sheds of Yak herders and in the gorge formed by Pisang Peak and Kang-guru Himal lower basin, walk continues following Nar-Phu River upstream to reach Dharmashala a small farm village with refreshing stops, walking further for an hour to reach at Meta for overnight halt in a quaint small farm village. 7Trek to Kyang 4,100m - 06 hrs. Morning walk leads far north heading towards Phu village around remote and isolated area of dry and, arid landscapes, on walks might spot wildlife’s like Blue Sheep’s, Musk deer’s and other wild animals including elusive snow leopard. walk continues to Kyang for overnight stop after an interesting day, Kyang with dozen houses of Tibetan style with fascinating Buddhist culture. 8Trek to Phu 4,580m - 05 hrs.Today our adventure leads to our main destination at Phu village, morning leads to Phu River following upstream for some time and then descending back on the same river, and then climb to reach into a gorge for some time and then uphill walk entering a wide glacial valley at Phu, a village of strong Tibetan influence with old culture, traditions and Buddhist religion. 9Exploration day in Phu visit Samdu Choling and Tashi Monastery.Today rest at Phu, a perfect place for acclimatization and short walks around Phu village visiting impressive Tashilkhang, Samdu Choling Monasteries and Kyauchyu waterfalls nearby. Phu Village with about 30 houses for 100 to 150 local inhabitants. 10Trek to Nar 4,110m - 06 hrs. From Phu village journey leads back on same trail for few hours descending to a narrow gorge at Phu khola, from here a slow climb to reach at Yughat, a small village with mani, chortens and Buddhist shrines, then finally reaching a flat field at Nar Phedi for overnight stop. Nargaon in comparison with Phu looks similar but smaller due to its remoteness with high altitude terrain of dry windswept land. 11Trek to Kang-La Base Camp 4,530 m - 05 hrs.After Nar-Gaon walk heads to remote wilderness, away from human settlement for few days, an interesting walk for few hours then with short ups and downs on rocky and arid path, passing cattle herders shelters with grazing field heading further west following Temdenzon khola into a wild surrounding with views of snow peaks and finally reaching at Kang la pass base for overnight camp at 4,530 meters altitude. 12Cross Kangla pass 5,322m and descend to Ngawal 3,650 m - 07 hrs. An early morning start to cross Kang-la at above 5,322 m high, climbs leads on high steep slope for few hours facing stunning views of Pisang Peak and Chulu Far East Peak, as climb reaches on top of Kang-La, rewarding with marvelous panorama of Annapurna massif mountain range which includes Chulu Peaks, Lamjung Himal and adjoining peaks of Annapurna range. walk from here on downhill path to Ngawal via Julu village on route Manang village back at main route of Annapurna circuit trail. Ngwal a small farm village located above Manang valley similar to Nar Phu people of Tibetan origin with surnames as Gurung and Ghale like other hill tribes of Annapurna region. 13Trek to Manang 3,540 m - 06 hrs.Morning views of mountains, from here onward altitude gains as the walk leads through forest with short uphill and views of Annapurna II and III, Gangapurna Chulu’s and Pisang peak. walk downhill to reach flat valley of Manang, on walks visit old Braga monastery with old Buddhist relics, ancient wall painting and frescos and stunning views of Annapurna Himalaya, from here an hour walk reaches at Manang village. 14Trek to Yak Kharka 4,210 m - 04 hrs.After a good rest days at Manang, walk towards Ghunsang village with short uphill to reach at Yak Kharka, an interesting walk with views of snowcapped mountains, on crossing a small stream reaching Yak Kharka for overnight stop, a small settlement with views of Gangapurna, Annapurna III and Chulu Peaks. 15Trek to Thorang- La High Camp or Phedi 4,450 m - 04 hrs.Morning starts with gentle uphill walks and getting closer towards Thorang-la after crossing a bridge with a climb along the river bank of Jarjung, finally walk leads at Thorang Phedi, here depending upon the physical conditions of the clients, if all goes well an hour steep climb to Thorang High Camp for overnight stop. 16Trek over Thorang La 5,416m | 17,769 ft to Muktinath 3,800 m - 06 hrs.Our highlight of the adventure having early breakfast walk leads to a long climb reaching at the top of Thorang-la Pass at 5,416 m / 17,700 ft. 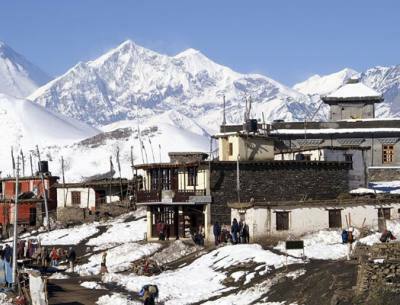 The highest point of the adventure with views of snowcapped peaks, and then with long descends to reach holy Muktinath around Lower Mustang area. On reaching Muktinath for the overnight stop, this is a holy spot for both Hindus and Buddhists the word Muktinath literally means ‘the place for Nirvana or Liberation’. 17Trek to Jomsom 2,715 m - 04 hrs.After Muktinath, the walk is much easier on moderate trails with big drop downhill to Kaligandaki river valley to reach at Kaligandaki River valley walking past the interesting village of Tibetan influence. After a pleasant walk exploring its unique culture of Bon and Buddhism morning walk is easy on the flat river bed of Kaligandaki to reach famous Jomsom town, the headquarter town of Mustang district with a small airstrip above Kaligandaki River. Jomsom area famous for delicious apples and its products, here celebrate with local apple products cider, brandy, and juices. Kaligandaki area is also famously known as Apple Pie Trail. 18Fly to Pokhara 860 m - 22 mins flights and transfer to hotelMorning as per the flight for Pokhara transfer to Jomsom airport for smooth and scenic short flight to land at warmer valley at Pokhara a beautiful place blessed with natural beauty of mountains-green hills and calm lakes of Phewa and Begnas. at Pokhara transfer to hotel by the Phewa lakeside with a free afternoon to enjoy scenic Pokhara with short walks around the lakeside. 19Drive or fly back to Kathmandu afternoon free at leisure.After a fabulous time on high Annapurna mountains and hills, taking a morning driving journey back to Kathmandu, on reaching Kathmandu after six hours of interesting drive, transfer to your hotels with an afternoon free at leisure or last day shopping souvenirs and handicrafts. (Options by air 30 minutes flight back to Kathmandu with great views). 20International Departure for Homeward bound.As per your international flight time transfer towards Tribhuvan International Airport for the journey back home or to respective destinations after a super and amazing time in Nepal Himalaya on Nar & Phu Trekking. 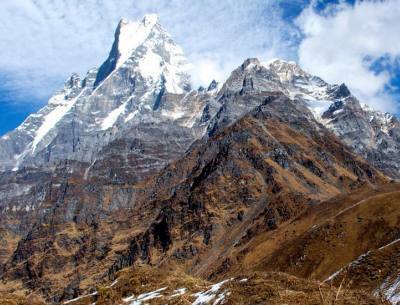 This is my first Time Nepal I did 20 days Nar Phu valley Trek with Reasonable Treks & Tour Pvt. Ltd. Anil He is organization for 20 days Nar Phu valley Trekking. guide and porter took good care of me, the guide he gives to everything information details on the way. I Show village and mountain. Really enjoyed the trek a lot, Guide was very helpful, friendly and kind. Porter, he is strong, honest and friendly too. 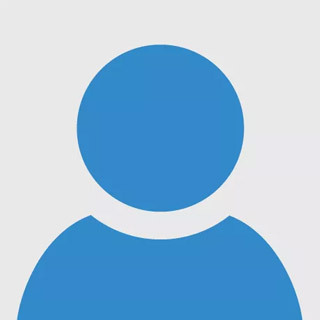 I want to highly recommend this company and staff for other travelers. Thank you so much, Mr. Anil, .i am really happy for your Trip. We will back Next Time !! Sheltered by the Annapurna Massif, is the Nar Phu Valley Trek harbors bewitching natural wonders and graceful ethnic communities. Annapurna, literal meaning in Nepali being the giver of food and nourishment, has civilizations that have flourished in its lush hills and the dry rain shadow areas alike. 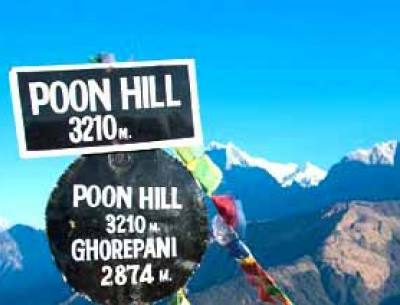 To trek through this region is a dream for most trekkers as it combines most things they seek for in one package. 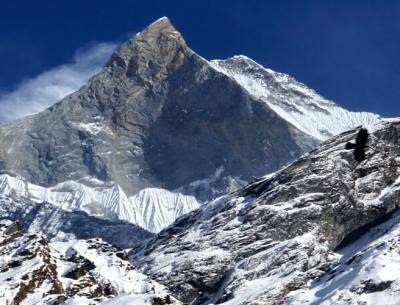 Iconic peaks such as the Machhapuchhre (6997m) and Hiunchuli (6441m) along with the notoriously dangerous and massive Annapurna (8091m) lie in this region. Dotted around the trails are villages of the charming Gurung, Manangi and the Thakali communities. Accommodation on Nar Phu Valley Trek. Nepali are known to be naturally graceful in nature. It's no different in the Nar Phu Valley Trek. Teahouses have sprung around the trekking regions, where you go from one teahouse to the next till you complete the trek. Tea houses offer basic accommodation and meals. These lodges are located along the routes and offer basic twin rooms, attached or common bathrooms, a dining room, and the ability to use wifi or take a hot shower at an extra cost. In addition to this, there are options for luxury treks where you can spend time on wonderful lodges and mini-hotels, which provide you with the most luxurious experience if you are ready to pay. Transportation on Nar Phu Valley Trek. You can take a flight, bus or hire a vehicle to travel to the Nar Phu Valley Trek. The most famous starting point of any trips in the Annapurna region is Pokhara. There is an established trekking infrastructure, with an easy access to start the trek at around an hours’ distance from Pokhara. From Pokhara, you have a choice if you want to start your trek right away or travel to the next destination by a vehicle. You will find plenty of buses leaving for different places every day at different times. You will need to get tickets to travel by buses in order to get a seat. After you reach the higher altitudes in the region, you find comparatively fewer vehicles. Food & Meals on Nar Phu Valley Trek. Backpack list on Nar Phu Valley Trek. Guides & Porters on Nar Phu Valley Trek. Electricity/ Recharge & Internet on Nar Phu Valley Trek. Group Size & Crew Member on Nar Phu Valley Trek. Medical Facility on Nar Phu Valley Trek. Flight Cancellations & Delay (Internal) on Nar Phu Valley Trek. Altitude Sickness on Nar Phu Valley Trek. Best Season to travel on Nar Phu Valley Trek. One of the most important things you must know before going off a trek is to know the best time to go on the trek. It isn't as easy as going off whenever you want to. The climate and the unpredictable weather during particular seasons can make a big difference in your experience of the trek. 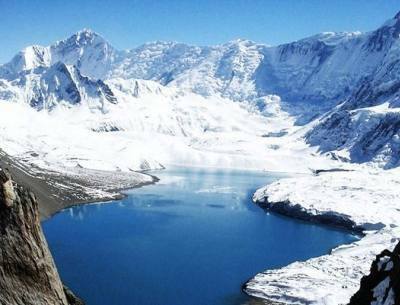 It is best to avoid the monsoon and peak winter season for treks in the Nar Phu Valley Trek. The ideal time to trek is considered to be around October to early December and late February to April. There is a lower risk of heavy snowfall and dangerous slippery trails. You'll find the perfect weather, dry trails and the best possible views. Insurance & Rescue on Nar Phu Valley Trek. When you are traveling at altitudes like that of the Nar Phu Valley Trek, you can face unexpected circumstances at any time during the journey. You must get yourself a good insurance policy that covers such situations. Many travel insurance companies do not have policies that cover high altitude traveling. Be sure to check your insurance policy. If you get injured or if you need immediate evacuation, you will require a rescue team to come for you. In dire cases, one might require a helicopter rescue, or might have to be carried back by a yak or horse. Rescue services such as hiring a helicopter can be really expensive. It is best to have insurance to cover all of these charges. You can find insurance providers who also cover your insurance at high altitudes. Booking & Payments on Nar Phu Valley Trek. You will not have a hard time finding a travel agency that will arrange for you a decent journey to the Nar Phu Valley Trek. You can schedule a trek at your choice of destination online or in person. Or you can also place your interest and the travel agency will give you the perfect time to leave for your trek. Terms and agreements applied, you will have to comply with the demands set by the agencies before booking your trip. You will be required to send necessary documents such as passports, and advanced payment for your confirmation. You can be charged a certain amount of money depending upon the agency if you want to cancel a booking. Acclimatization on Nar Phu Valley Trek.